Registration among Hispanic voters is skyrocketing in a presidential election cycle dominated by Donald Trump Donald John TrumpDemocrats' CNN town halls exposed an extreme agenda Buttigieg says he doubts Sanders can win general election Post-Mueller, Trump has a good story to tell for 2020 MORE and loud GOP cries to close the border. A whopping 80 percent of respondents in a poll of registered Hispanic voters in Colorado and Nevada said Trump's views on immigration made them less likely to vote for Republicans in November. In Florida, that number was 68 percent. The figures are sparking confident tones from Democrats, who think their party’s nominee will benefit from a huge advantage in the fall not only in the presidential race but also in battles for the House and Senate. Because of the contrast between the GOP and Democratic fields, “we feel absolutely confident about our chances of electing Democrats up and down the ballot in November,” said Walter Garcia, western regional communication director for the Democratic National Committee. Democrats have already targeted Colorado, Florida and Nevada with at least $15 million for Hispanic outreach, according to Vargas. In Colorado, where 15 percent of eligible voters are Hispanic, the demographic has already shown its ability to flip elections. The 2016 Colorado Democratic caucuses were one of the first big tests for presidential candidate Bernie Sanders Bernard (Bernie) SandersDemocrats' CNN town halls exposed an extreme agenda Buttigieg says he doubts Sanders can win general election Meghan McCain: Bernie Sanders supporting prisoners being able to vote 'bats**t insane' MORE against rival Hillary Clinton Hillary Diane Rodham ClintonDavis: The shocking fact that Mueller never would have accused Trump of a crime Trump says he would challenge impeachment in Supreme Court The Hill's Morning Report - Will Joe Biden's unifying strategy work? MORE. With nearly 30,000 newly registered voters and strong support from Hispanic millennials, Sanders beat Clinton by more than 20,000 votes. President Obama won 51.5 percent of the vote in Colorado in 2012, compared to 46 percent for GOP nominee Mitt Romney. In Nevada, Obama won 52 percent of the vote to Romney’s 46 percent. Arizona has been a relatively safe state for Republicans in recent presidential elections, but Democrats have long wondered if they could make it competitive. Romney won 53.5 percent of the vote there in 2012, Obama 44.5 percent. Yet the real danger for Republicans could be down the ballot — particularly in the battle for the Senate, where longtime Sen. John McCain John Sidney McCainWhy did Mueller allow his investigation to continue for two years? If you don't think illegal immigrants are voting for president, think again 10 factors making Russia election interference the most enduring scandal of the Obama era MORE (R-Ariz.) could be a target. Obama won 74 percent of the Hispanic vote in 2012, according to exit polls by NBC. A Democrat in 2016 would likely depend on larger Hispanic turnout and a larger share of the white vote to win the state. Romney hurt himself with Hispanic voters in 2012 by suggesting that undocumented workers self-deport. He moved to the right on immigration and border security in the primary and was relatively quiet on the issue in the general election. Both parties think Trump’s rhetoric, which has included insults directed at Mexicans and a plan to build a wall on the border and make Mexico pay for it, could be more difficult to overcome in a general election. Immigration was shown by an America's Voice/Latino Decisions poll to be the primary issue driving Hispanics away from Republican candidates in 2016. However, Hispanic voters nationally said the most important issue facing the country is the economy. She noted that Clinton was opposed to giving drivers licenses to undocumented workers as a senator from New York but has now reversed her position. “Clinton’s flip flops and hypocrisy on immigration are a mile long because she will tell voters anything to win an election,” Guerra said. A win by a Democrat presidential candidate in Florida, Colorado and Nevada would make it very difficult for a GOP candidate to reach 270 electoral votes and win the White House. In fact, Democrats could actually lose the swing state of Ohio but win Pennsylvania or Wisconsin and get to 270 — simply by holding other states that have voted for the Democratic nominee in presidential elections for the last six cycles. Jon Ralston, a veteran Nevada political journalist who is not surprised by the numbers, said, “The real problem is that Trump, and, to a lesser degree, Cruz, will drive up Hispanic turnout against Republicans." He said the only path for the GOP nominee to the White House in such a situation would be to win more white votes. If the numbers hold true, the electoral map becomes daunting for Republicans with the three states in question turned solid blue. 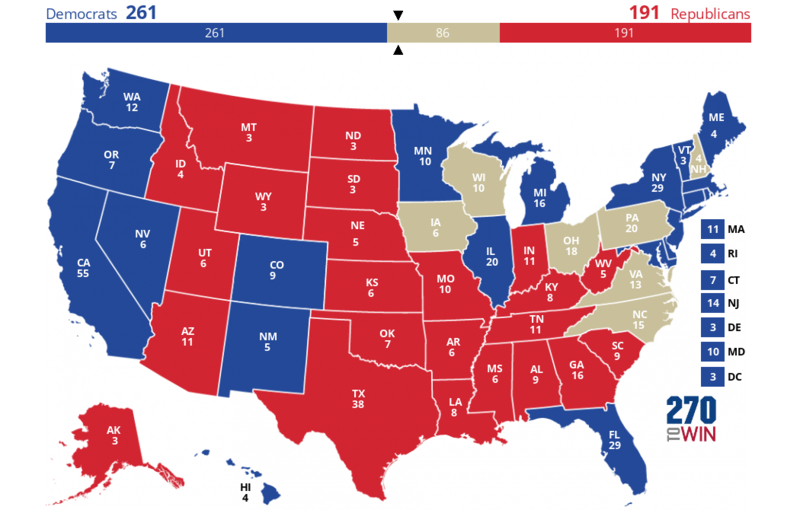 Based on 270towin's 2016 toss-up map, Democrats would only have to win one of either Wisconsin, Ohio, Pennsylvania, Virginia or North Carolina (or a more unlikely combination of only New Hampshire and Iowa) if the Hispanic vote does indeed deliver Colorado, Florida and Nevada. "It’s not a favorable situation among Latinos and it doesn’t seem like Republicans will be able to make it up among white voters," said Lublin.